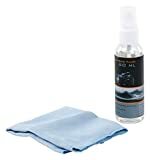 Camera lens cleaning kit to remove fingerprints, dust and dirt in a gentle and effective way. This entry was posted in Discount Photography and tagged Camera, Camlink, Cleaning, lens by Ball Photo. Bookmark the permalink.